NORSOK is an abbreviation for ”Norsk Sokkels Konkurranseposisjon” meaning – Norwegian Continental Shelf Competition Position and the purpose behind it is to reduce delivery time, ensure quality, decrease production time and cost for building and maintaining the petroleum installations of the Norwegian Offshore Sector. The material specifications that comprise one out of 29 areas of expertise within the NORSOK, and they have had a great impact on the standardisation process of mechanical and chemical demands on tube, pipe, flanges, fittings, plates and round bar. Which in turn has enabled the stocking of material to the demanded specification in a larger scale then previously. The project of homogenising demands on structural steel started in the early 80’s in a close collaboration between the Norwegian oil companies and the oil service industry. The two Norwegian Standards for structural steel, ( NS 12603 – plates and NS12604 – sections ) were ground breaking pioneer work on an international scale. These two standards were written by designers and end-users – and not by the steel producers. The two standards later became the basis of EN 10225 – Weldable Construction Steel for fixed installations at Sea. Today virtually all steel structures in use on the Norwegian Continental Shelf are in full accordance with the NORSOK standard, developed by the Norwegian Oil & Gas industry in cooperation with the international steel industry. The founding principles of the NORSOK standard, is based on international pre-existing standards such as ISO, EN, BS and others. The Norsok Material Datasheet – the MDS’ – specify the alloys relevant productions standards that apply, in addition to further demands or deviations, in the production of the product. Sverdrup Steel AS stocks a complete range of round bar and plate in high performance stainless steel alloys. We stock products according to NORSOK requirements that also meet a wide range of customer specific specifications both domestically and internationally. Before we move on to examples from different MDS’s from NORSOK M630 in the next chapter, I want to comment on the NORSOK M650 standard and why it has become so integral to products being supplied to the Norwegian petroleum industry. NORSOK M650 has established a set of demands on the production process to determine whether the producer has sufficient competence and experience in the production of high performance alloys, and the facilities and equipment to products with the correct properties. The M650 standard applies for all products produced in the alloys: Duplex, Super Duplex, high alloyed Austenitic Stainless grades, Nickel Alloys, Titanium Alloys in addition to HIP products, forgings and castings. It also comprise some critical components or products in low-alloyed steel, as well as cold and hot forming of pipe. 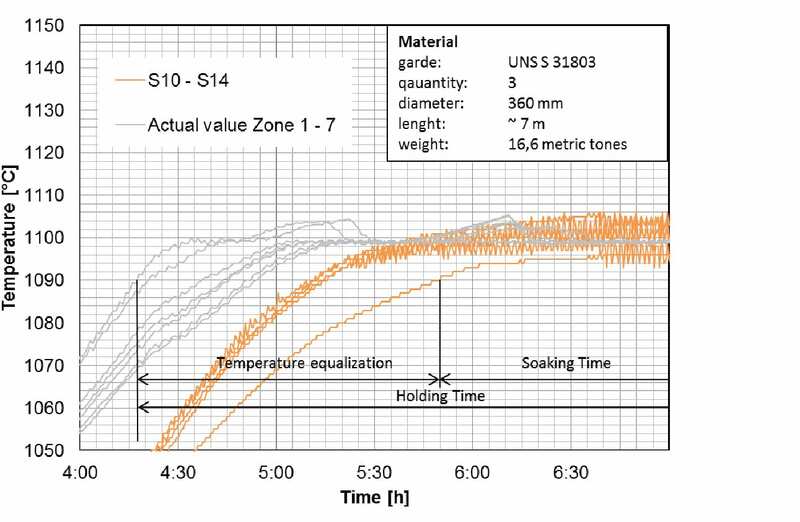 Through several revisions, the M650 Standard has been driven towards focus on the producers material knowledge and their control of the steps of the production and in particular a strong focus on heat treatment and quenching procedures. The last revision, NORSOK M650-edition 4- September 2011, was based on quality failure found in material delivered of high-performance alloy to offshore projects caused by insufficient control and performance of the heat and quenching procedure, coupled with improvement potential of test procedures. Control of heat treatment unity in accordance with API 6A or ASTM A991 with additional demands. The placement and spacing of the products in the oven. Register of heat treatment charts in the oven and the in the material. Increased testing of round bar, forged products and HIP products. Purchasing party is a contractual part of the supply line in relation to the end user and is responsible for the ordering of the material from the producer. Purchasing party is obliged to ensure that the producer is qualified in accordance with the relevant elements of the NORSOK standard. The producer has to have the correct approvals and to continuously ensure that the production is in accordance with the “Manufacturing Summary”. The Qualifying Company shall monitor the qualification exercise, review and in the end accept the resulting qualification test record (QTR) and as proof of the acceptance sign and stamp the QTR front page. It is crucial for the producer that the qualifying body is a well renowned party, that has the weight and confidence needed to ensure that other parties and customers approve their work on the QTR’s. One has to be aware that end users does not accept QTR’s automatically without the fore mentioned notoriety of the qualifying body. Several oil companies conduct their own audit of producers or review the documentation produced that has been the basis for the NROSOK approval, in order to establish weather or not to qualify the producers in accordance with their own specifications for approved suppliers. Statoil internal TR2000 system contains a list of approved producers, however, external companies with access to these lists are responsible for their own choice of producers. This is a key document describing all aspects of the production processes and the producer’s level of competence needed for the production of the alloys to be qualified. Qualified production route, type of product, grade of material and size range. 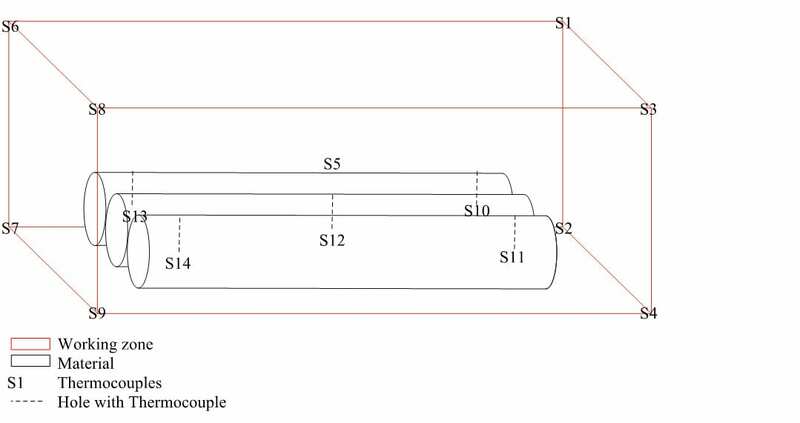 Production steps in a logical sequence, see fig1. Drawing of the test samples location and orientation at the product, see fig 3 and 4. The consequences of wrong or insufficient heat treatment of high alloyed materials, can have large economic consequences for both producer and end user. The requirements to the heat treatment furnace, temperature measuring equipment and the heat treatment procedure, have become more specific and stringent in the last edition of M650. The yearly verification of the heat treatment procedure is also a new requirement of M650. Qualification of heat treatment furnace and procedure. Heat treatment facilities and equipment shall fulfil the requirements in API 6A – Annex M or ASTM A991 and be performed yearly. Results to be documented as in table 1. 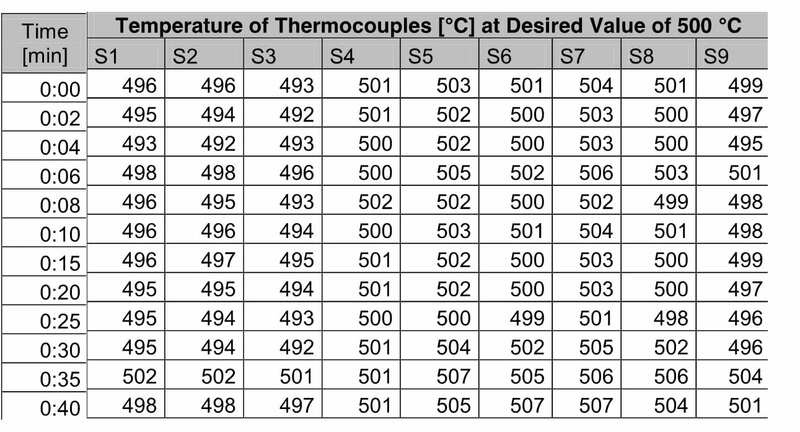 Time/ temperature curves are not sufficient. Fig 1. 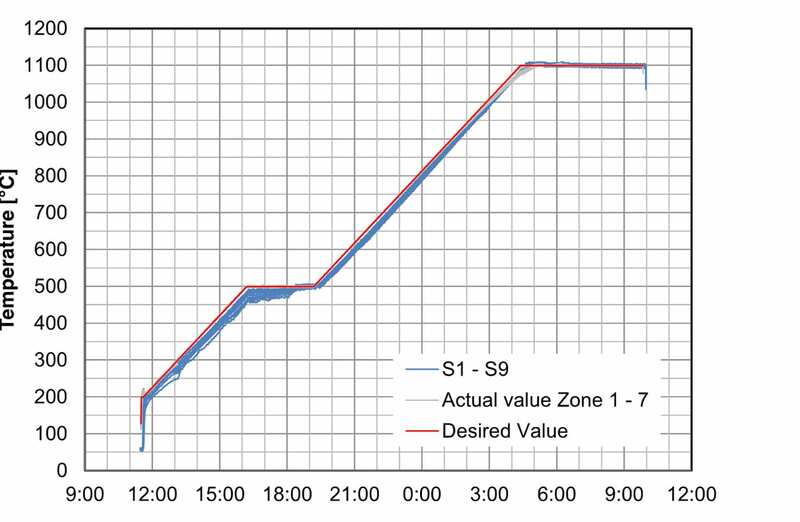 Placing of thermo elements, S1 – S9 in furnace and S10 – S14, in bar materials. Time to achieve even material temperature in bar is 90 min. Fig 3. Verification of temperature profile in furnace. 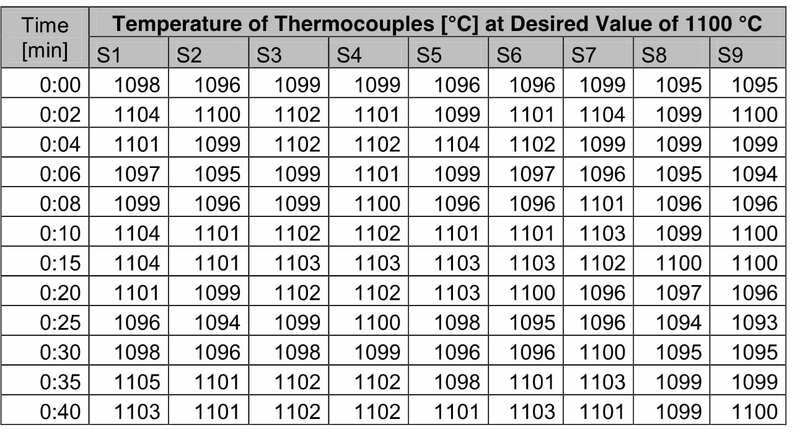 The 9 thermo elements are within acceptable values according to API 6A, < +/- 8degC in lower temperature area and < +/- 14degC in the upper area. Fig 4. Temperature variations in lower temperature area. The manufacturer shall establish a qualification test record (QTR) with content from performed tests. The established procedures including the furnace verification test and heat treatment procedure are included in the QTR. The Qualifying Company shall monitor the qualification exercise, review and in the end accept the resulting qualification test record (QTR) and as proof of the acceptance sign and stamp the QTR front page.